Although retirement income is important, your Plan also helps protect your family’s financial security after your death—either before or after retirement. By law, all pension plans must provide certain survivor benefits for married participants who are vested. Your Plan goes beyond that and provides valuable benefits to your survivors whether you are married or not. The previous sections explained your retirement benefits. Your Plan also provides a variety of death and survivor benefits. One set is available to families of participants who die before retirement. The other is for families of participants who die after retirement. 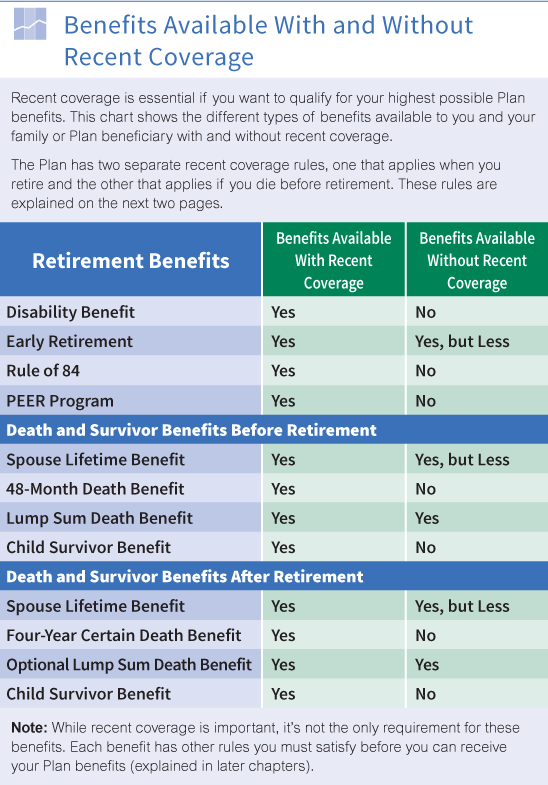 Click here to see each of your Plan’s death and survivor benefits and a summary the rules for each. Notice that some benefits are different if you have recent coverage. Others are only available if you have recent coverage. The rest of this section explains all of these benefits in detail. Some of the death benefits payable from the Plan are payable only to your Plan beneficiary. Your Plan’s Beneficiary Designation Form is the only way to name a Plan beneficiary or cancel a previous designation. See the sample Beneficiary Designation Form. The recent coverage rules are different depending on whether you die before or after retirement. If you die before retirement, you have recent coverage if you work at least 1,500 covered hours during the 60-month period ending with the month of your death or ending with the date you were first eligible to retire. If you die after retirement, you have recent coverage if you have 1,500 covered hours in the 60-month period ending just before your pension effective date. You can also lock in your recent coverage if you earn at least 1,500 covered hours in any 60-month period ending after you complete 25 years of contributory service. The chart below provides examples of how you meet the recent coverage rule on your earliest retirement date. It describes how you can lock in your recent coverage. Click here for a complete explanation of recent coverage including a list of the benefits payable with and without recent coverage. Here are the three ways you can satisfy the recent coverage requirement if you die before retirement. You have 1,500 covered hours in the 60-month period ending with the month of your death. You have 1,500 covered hours in the 60-month period ending with the month that begins just before your earliest retirement date or if later, your date of death. You have 1,500 covered hours in any 60-month period ending after you complete 25 years of contributory service. Your surviving spouse receives this lifetime benefit if you are a married vested participant and die before retirement. Note: If you die after age 70, only the after retirement death benefits are payable, even if you don’t start drawing your retirement benefits before your death. Benefit Amount. Your surviving spouse receives 66 2/3% of the employee and spouse pension you would receive if you retired the day before your death. If you are not eligible to retire, your spouse’s benefit is calculated as if you were age 55 on your date of death. This benefit is calculated under the Rule of 84 or PEER if you are eligible for either of these early retirement benefits when you die. Benefit Effective Date—Death Before Age 65. Once your surviving spouse applies for the spouse lifetime pension, he or she can request that benefit payments go back to the beginning of the month following your death. 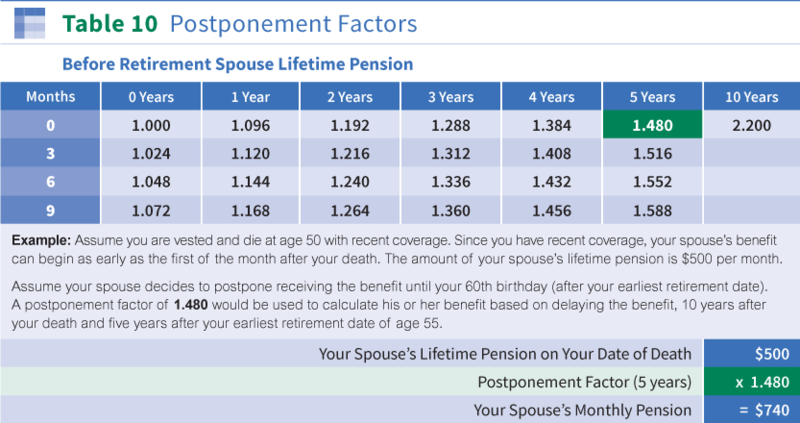 Or, your spouse can request a later benefit effective date up to your 65th birthday (as explained on this page). However, under Plan rules, benefit payments cannot go back more than 23 calendar months from the date when your Administrative Office receives the request on the proper form (24 months if the request is received on the first day of the month). Benefit Effective Date—Death at Age 65 or Later. Once your surviving spouse applies for the spouse lifetime pension and the application is approved, benefit payments are made back to the first of the month following your death. Your spouse cannot request a later benefit effective date. Benefit Amount. Your surviving spouse receives 50% of the employee and spouse pension you would receive if you retired the day before your death. If you are not eligible to retire, your spouse’s benefit is calculated as if you were age 55. Benefit Effective Date—Death Before Age 65. Once your surviving spouse applies for the spouse lifetime pension, he or she can request that benefit payments go back to the beginning of the month following your death if you die after age 55. If you die before age 55, your spouse can request that benefit payments begin the month after your 55th birthday. Regardless of your age when you die, your spouse can request a later benefit effective date up to your 65th birthday. Under Plan rules, benefit payments cannot go back more than 23 calendar months from the date your Administrative Office receives the request on the proper form (24 months if the request is received on the first day of the month). Benefit Effective Date—Death at Age 65 or Later. Once your surviving spouse applies for the spouse lifetime pension and the application is approved, benefit payments go back to the first of the month following your death. Your spouse cannot request a later benefit effective date. If you die before age 65, your surviving spouse may postpone the date when the before retirement spouse lifetime pension begins. The benefit effective date your spouse chooses cannot be later than your 65th birthday. If you die without recent coverage, the benefit effective date your spouse chooses cannot be before your earliest retirement date. The benefit effective date must always be the first day of a month. By choosing a later benefit effective date, your spouse qualifies for an increase in the amount of his or her spouse pension in either of the following situations. The spouse pension increases if you die before your earliest retirement date and your spouse chooses to start benefit payments later than your earliest retirement date. The amount of the increase depends on the number of calendar months between your earliest retirement date and the benefit effective date requested. Click here to see the postponement factor used to calculate the increased benefit amount. The spouse pension increases if you die after your earliest retirement date and your spouse chooses to start benefit payments later than the month following your death. Click here to see the postponement factor used to calculate the increased benefit amount. Note: If your spouse dies before applying for the spouse lifetime pension, or before the benefit effective date he or she requests, no benefits are payable. When your spouse applies for the before retirement spouse lifetime pension, he or she must choose a benefit effective date. On the application form, your spouse can request an estimate of the spouse pension amount based on the desired benefit effective date. The application form provides additional information on how to request this estimate. If your spouse chooses a benefit effective date that is more than 180 days after he or she applies for benefits, the Administrative Office sends a reminder notice shortly before your spouse’s desired benefit effective date. This notice includes a form for your spouse to reconfirm the choice of a benefit effective date and current mailing address. To start benefit payments, your spouse must complete and return this form to the Administrative Office. To make sure the notice is received, your spouse must keep the Administrative Office advised of any changes in his or her mailing address. Your survivor benefit rate is more than 21¢. Receiving Social Security survivor or disability benefits because of your death. Benefit Amount. 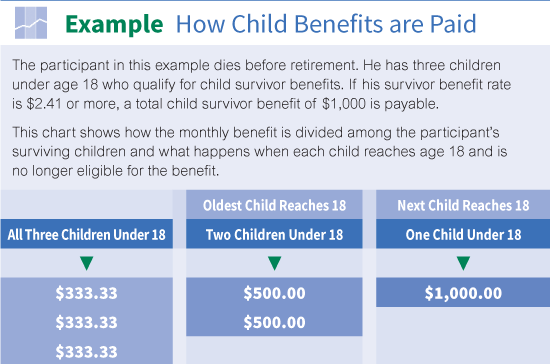 Click here to see the amount of the child survivor benefit based on your survivor benefit rate. This total monthly amount is divided equally among your eligible children. In most cases, the Plan pays each child’s benefit to the person receiving Social Security benefits for that child. The survivor benefit for each child stops when that child is no longer eligible (usually age 18). After that, the survivor benefit for that child is divided among any remaining eligible children. Child survivor benefits stop entirely when there are no longer any eligible children (usually when the youngest child reaches age 18). Click here for an example of how child survivor benefits are paid. Survivor Benefit Rate. Your Plan calculates your survivor benefit rate by dividing the total basic contributions paid for your covered employment after 1991 by your total covered hours after 1991. For participants who died before January 1, 2000, your Plan calculated their survivor benefit rate by dividing the total basic contributions paid for their covered employment after 1986 by their total covered hours after 1986. Remember that basic contributions used do not include PEER contributions. Eligibility. This benefit is payable to your Plan beneficiary if you are a vested participant and die before retirement. (Click here for information about how to name or change a Plan beneficiary.) It is payable whether you are married or single. You do not need recent coverage for this benefit to be payable. Benefit Amount. Your Plan beneficiary receives an amount equal to 50% of the total basic contributions paid into the Pension Trust on your behalf up to a maximum of $10,000. This benefit is payable in a lump sum. Eligibility. Your Plan beneficiary receives this benefit if you are a vested participant with recent coverage and die before retirement. (Click here for information about how to name or change a Plan beneficiary.) This benefit is only payable if you are not married. You must have recent coverage at death. Click here for details about recent coverage. Benefit Amount. Your Plan beneficiary receives an amount equal to 48 times the monthly life only pension you would receive if you retired the day before your death. If you are not eligible to retire, your Plan calculates this benefit as if you were age 55. The benefit is payable in a lump sum. This benefit is calculated under the Rule of 84 or PEER if you are eligible for either of these early retirement benefits when you die. Your spouse receives this lifetime benefit if you choose either the regular or optional employee and spouse pension when you retire. This monthly benefit is payable to the person you are married to when you retire. Payments begin on the first of the month following your death. Benefit Amount. If you choose the regular employee and spouse pension, your spouse receives 66 2/3% of the benefit you were receiving under that form of pension. If you choose the optional employee and spouse pension, your spouse receives 75% of the benefit you were receiving under that form of pension. If you choose the benefit adjustment option with either form of employee and spouse pension, your spouse’s benefit is calculated as if you chose the employee and spouse pension without the benefit adjustment option. Benefit Amount. If you choose the regular employee and spouse pension, your spouse receives 50% of the benefit you were receiving under that form of pension. If you choose the optional employee and spouse pension, your spouse receives 75% of the benefit you were receiving under that form of pension. If you marry or remarry after your pension effective date, your new spouse does not qualify for a spouse lifetime pension. The after retirement spouse lifetime pension is only payable to the spouse you were married to on the date you chose this benefit payment option. If you choose an employee and spouse pension and later divorce, your employee and spouse pension stays in effect. Your former spouse remains the person eligible to receive the spouse lifetime pension after your death. This rule may not apply if a court enters a Qualified Domestic Relations Order (QDRO) that provides for conversion of your employee and spouse pension to a life only pension and certain other requirements are met. Contact your Administrative Office for details. Eligibility. Your Plan beneficiary receives this optional lump sum death benefit only if you choose this benefit when you retire. You can choose this benefit whether or not you have recent coverage. You can also choose this benefit if you are married or single. If you are married, your spouse’s consent is required. The optional lump sum death benefit is available with any of the payment options the Plan offers. Click here for more information about the Plan's benefit payment options. Benefit Amount. Your Plan beneficiary receives an amount equal to 12 times the monthly benefit you would receive if you choose the life only pension without the benefit adjustment option. The benefit is payable in a lump sum. If you choose the optional lump sum death benefit when you retire, your monthly benefit (and any benefits based on it) is reduced by a small percentage to provide for this death benefit. Receiving Social Security death or disability benefits because of your death. Benefit Amount. 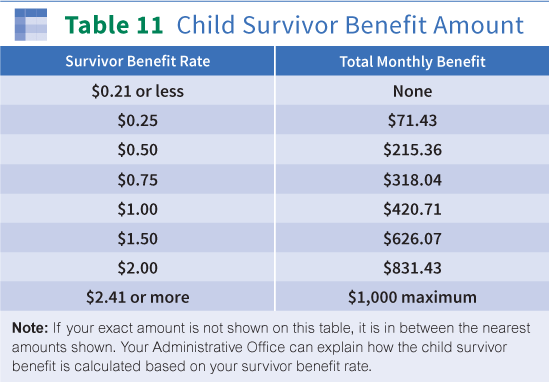 Click here to see the amount of the child survivor benefit based on your survivor benefit rate. This total monthly amount is divided equally among your eligible children. In most cases, the Plan pays each child’s benefit to the person receiving Social Security survivor benefits for that child. The survivor benefit for each child stops when that child becomes ineligible (usually age 18). After that, the survivor benefit for that child is divided among any remaining eligible children. Survivor benefits stop entirely when there no longer are any eligible children (usually when the youngest child reaches age 18). Survivor Benefit Rate. Your Plan calculates your survivor benefit rate by dividing the total basic contributions paid for your covered employment after 1991 up to your pension effective date by your total covered hours after 1991 up to your pension effective date. For participants who retired before January 1, 2000, the Plan calculates their survivor benefit rate by dividing the total basic contributions paid for their covered employment after 1986 up to their pension effective date by their total covered hours after 1986 up to their pension effective date. Remember that basic contributions do not include PEER contributions. Click here to view how a child survivor benefit is paid. Eligibility. Your Plan beneficiary receives this benefit only if you retire with recent coverage and choose a life only pension or life only pension with a benefit adjustment option. Also, as explained next, this benefit is only payable if you die before receiving approximately 48 months of benefit payments. Benefit Amount. If you choose the life only pension without a benefit adjustment option, your Plan beneficiary receives the difference between the total benefit payments you actually receive before your death and 48 times your monthly life only pension. This benefit is payable in a lump sum. 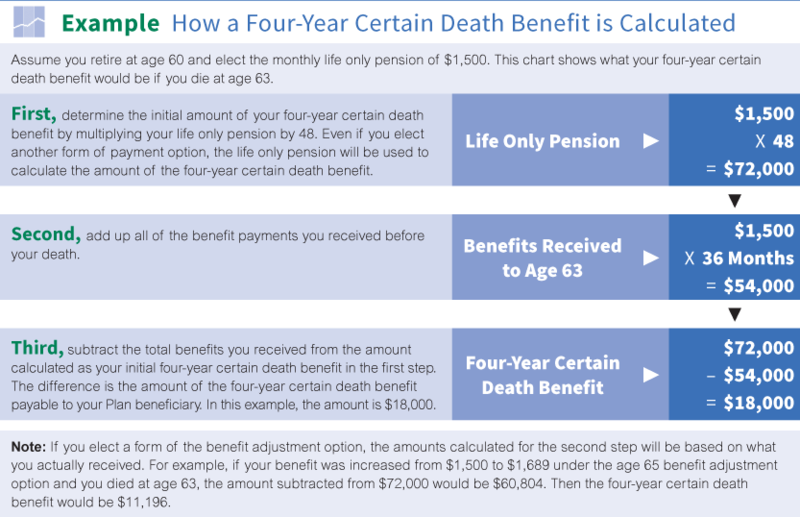 Click here to see how a Four-Year Certain Death Benefit is calculated. If the total benefit payments you receive before your death are more than 48 times the amount of your life only pension, this four-year certain death benefit is not payable. Benefit Amount. If you choose the life only pension with a benefit adjustment option, your Plan beneficiary receives the difference between the total benefit payments you actually receive before your death and 48 times your monthly benefit under the life only pension without benefit adjustment option. The benefit is payable in a lump sum. Click here for an example of how this benefit is calculated. If the total benefit payments you receive before your death under the benefit adjustment option are more than 48 times what your monthly benefit would be under the life only pension, this four-year certain death benefit is not payable. It is a good idea to keep your family and Plan beneficiary informed of the death and survivor benefits explained in this section. Be sure they know where you keep your Personal Benefit Statements and other Plan information. Once your Administrative Office learns of your death, they review your Plan records and advise your survivors of the death benefits that may be payable. This is especially important if you are retired—so that your benefits may be stopped and any overpayments avoided. No death benefits are paid unless a properly completed benefit application is received and approved by the Pension Trust. Your family or Plan beneficiary may request the necessary application forms from any Administrative Office. Your survivors may be asked to provide documents such as your death certificate, marriage certificate, spouse and child birth certificates, adoption papers and Social Security Award Letter (for child benefits). They can file their applications before they have all the proof needed for payment of benefits. They should not delay applying for benefits just because they don’t have all the documents readily available. Your family should contact any Administrative Office if they have questions. 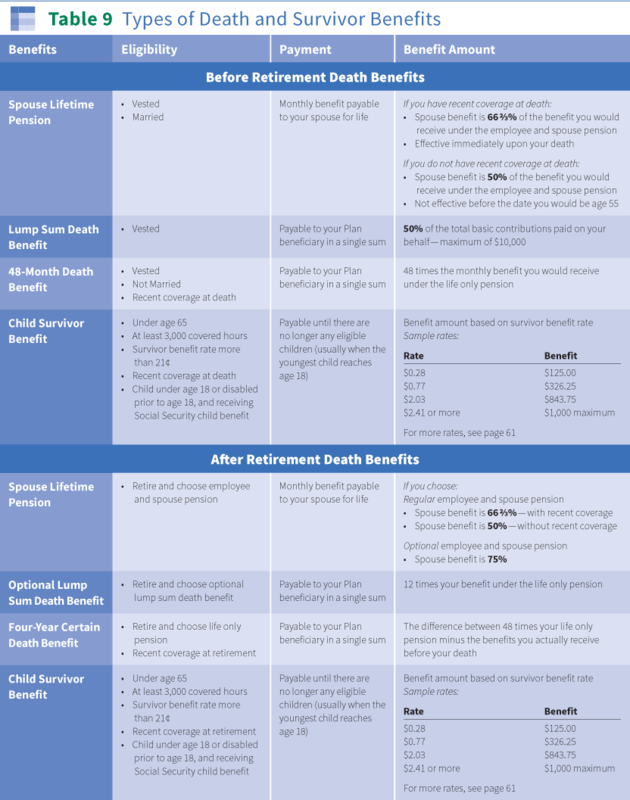 Some of the Plan’s death benefits are only payable to your Plan beneficiary. For this reason it is extremely important that you name a beneficiary and keep that designation updated if there are any changes in your family status. When naming a Plan beneficiary, you must provide their full name and their relationship to you (for example, spouse, parent, child or friend) and their current mailing address. Click here to see a sample form. If naming a trust or estate, you must provide its full legal name (for example, The John and Mary Smith Trust or The Estate of John Jackson), not the name of the trustee or executor. This ensures that your benefit will be paid to the trust or estate, not to a specific person. If you want to name a charity or other organization as your Plan beneficiary, be sure to include its complete name and address. Beneficiary Designation Forms received after your death are not recognized, even if they were signed and mailed before your death. Ask your Administrative Office to send you the proper form or you can download here. Note: Only beneficiary designations that are made on the forms supplied by the Pension Trust are recognized. Beneficiary designations made in your will or on forms used by other pension or health and welfare trusts or for other union benefits (for example, life insurance) are not accepted by this Pension Trust. Before You Retire. Even if you are new to the Plan, you should name a Plan beneficiary to receive any lump sum death benefits that are payable if you die before retirement. Your Plan beneficiary can be any person or persons, including your estate. Your Personal Benefit Statement lists your Plan beneficiary on file as of the previous year-end. For convenience, a blank beneficiary card is also enclosed with your statement. Click here for information about your Personal Benefit Statement. Click here for details on How to Read Your Personal Benefit Statement. When You Retire. Naming your beneficiary is extremely important at retirement. If at the time of your death any lump sum death benefits are payable or there are outstanding benefit payments payable to you, those benefits are paid to your beneficiary. You must complete a new Beneficiary Designation Form as part of the benefit election process (see How Retirement Benefits Are Paid for more information). If you are married and do not name your spouse as your sole beneficiary, your spouse must consent to your election and your spouse’s consent must be notarized or signed in front of an authorized employee of your Administrative Office. See Making Your Pension Choices for details. Your beneficiary designation is not effective unless an Administrative Office receives your signed Beneficiary Designation Form before your death. There are no exceptions. Be sure your correct beneficiary designation is on file with your Administrative Office. You may change your Plan beneficiary at any time by naming a new beneficiary on a Beneficiary Designation Form provided by the Pension Trust (as explained above). Your new beneficiary designation is not effective unless this completed and signed form is received by an Administrative Office before your death. Changes in your family status, such as divorce, marriage or other family changes, do not affect any Plan beneficiary designation you previously made. A divorce settlement that awards you all of your retirement benefits does not cancel a previous designation you filed with the Pension Trust designating your former spouse as your Plan beneficiary. You should consider naming a new Plan beneficiary if you marry or divorce, if your spouse dies, if you have children or if your designated beneficiary dies. Your Plan beneficiary is selected from the first of these classes with a survivor. If there is more than one survivor in that class, they share equally in any lump sum death benefit payable. Some participants mistakenly assume that beneficiaries named through a will or living trust or life insurance forms will cancel previous beneficiaries. Others think that getting divorced automatically removes the former spouse as beneficiary. Don’t make these mistakes. You must send in a new Beneficiary Designation Form or prior designations won’t be changed. Changes in your family status, such as divorce, marriage or other family changes, do not affect any Plan designations you previously made. You should consider naming a new Plan beneficiary if you marry, divorce, or have children, or if your spouse or designated Plan beneficiary dies. Contact your Administrative Office if you have questions. Click here for questions and answers about Death & Survivor Benefits.